Chrome cobalt upper dentures may sound a bit strange when you first hear about them. After all, why would you want something metal in your mouth? Chrome Cobalt upper dentures have the main advantage of being very strong, and are also thinner than the alternative acrylic materials. The difference in weight between a chrome cobalt alloy denture is usually quite small, and not really significant for most people. What are the disadvantages? The main one is cost. Cobalt chrome dentures take longer to make, because the metal alloy is extremely hard, and difficult to work with. This makes it more time-consuming and complicated for the dental technician, so his bill for his work will be more than for a simple acrylic denture. IN ADDITION, the chrome cobalt metal alloy is more expensive than the equivalent acrylic. So, what situations would be good for chrome cobalt upper dentures? Why spend more money? It's important to understand that cobalt chrome dentures look like any other dentures from the "outside". You do not see a load of metal, like Richard Kiel as "Jaws" in the James Bond movies! The teeth on the dentures are normal acrylic denture teeth. 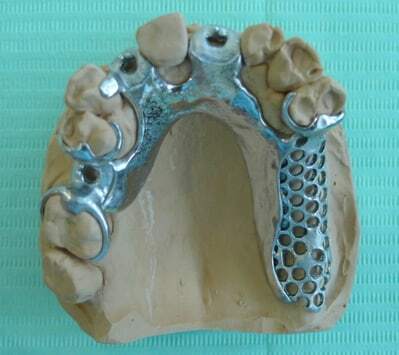 What IS different is the framework or base for the denture that fits inside your mouth. This framework, hidden from view, can be made of chrome cobalt. 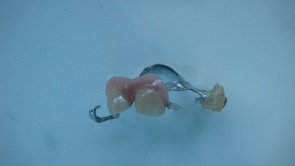 Upper dentures in particular can be made much smaller than the equivalent acrylic denture. 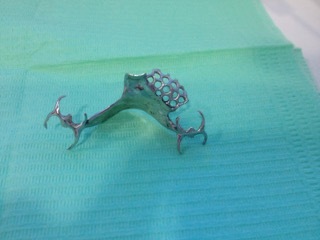 Although it may not look like it, this framework is much thinner than the equivalent acrylic denture base! For a lot of folk, one of the biggest problems with wearing a dental plate is the sheer bulk of the thing. It's quite a mouthful! So any way of making a denture smaller and thinner is a big help. 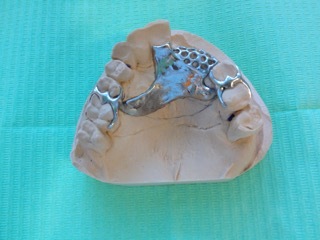 BUT if we try to make a standard acrylic denture thinner, it will frequently end up being too thin, and therefore weak. It will crack or break. 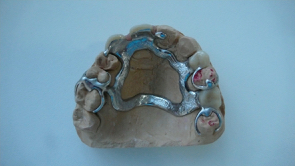 Cobalt chrome dentures can be made very thin, and the metal alloy is strong enough to resist breaking or bending. It sounds like the ideal solution! The cost of the metal alloy is much more than the cost of acrylic. Because the metal is so hard and tough, it takes the lab technician much longer to make the denture. IF YOU WOULD LIKE MORE INFORMATION ABOUT DENTURES, LOOK AT MY E-BOOK ALL ABOUT EVERY TYPE OF DENTURE, available to download for just $9.95. Below, the view from the front. 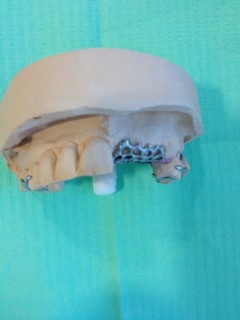 Acrylic denture teeth will be fitted to the perforated metal area, to blend in with the natural teeth. 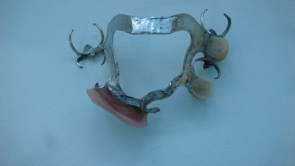 Below, this is what the chrome cobalt denture looks like off the model, but still without any teeth attached. Below shows the laboratory model with design options pencilled onto the plaster. Above, a view of the denture still on the laboratory model. 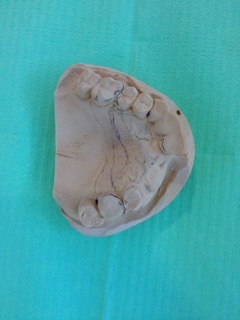 Above, a view of the denture off the model, from the front, looking at the front teeth. Above, a view of the denture from the "inside", the side that fits against the palate. As with most things in life, there are always trade-offs and compromises. The Chrome Cobalt upper denture is not perfect. BUT, if you are having problems with acrylic dentures cracking or breaking, or else you are finding the size of your denture too much to get used to, ask your dentist about a cobalt chrome denture. It could be a big improvement for you!